Ironically, just over a hundred years ago there were hardly any white-tailed deer in the state. Hunting and lack of proper habitat had severely limited their numbers, but now that is not the case. There are two major changes to the deer’s environment that have caused this dramatic population change. First, deer are an "edge species", which means they thrive in habitat that has wooded borders next to fields or open spaces. New Jersey used to be made up of larger, homogenous tracts of land that were rapidly subdivided over and over again, which, in turn, created a plethora of “edge” habitat that we currently still have today. Second, our state's largest herbivore has thrived from the lack of any natural predators, which were quickly extirpated as our human population grew (Now, if we could only re-introduce wolves and mountain lions...). So now you can see we have ourselves to blame for creating the perfect scenario for deer to flourish! For those of us that love gardening and maintaining a beautiful landscape, deer are an issue on many levels. Not only are they a very mobile animal, but they can jump eight foot fences! In addition, their physiology allows them to digest different food materials at different times of the year. 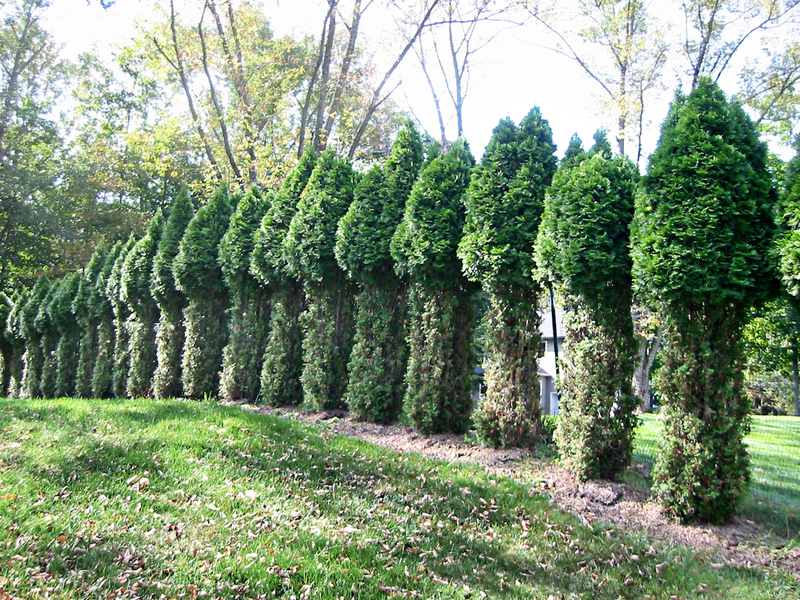 This is a natural survival adaptation, and the reason why they leave your yews and arborvitae alone during the summer, yet thrive on these evergreens in the winter. The enzymes in their stomach change to allow digestion and retrieval of nutrients from these harder materials; a useful adaptation during harsh winters when food is often scarce. Deer have wreaked havoc on our natural, agricultural and landscaped worlds. Farmers are constantly battling deer to save their crops, and extensive overgrazing of our forests’ undergrowth often threatens the integrity and existence of our native flora and fauna. I would bet that everybody reading this article has seen the effects of deer in our natural and landscaped surroundings. 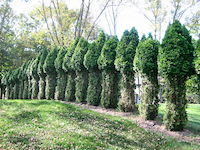 Have you ever seen a row of arborvitae that looked like popsicles on a stick? Or maybe you've gone to bed one night after seeing a beautiful bed of tulips and woken up to a depressing bed of flowerless stems? At the very least you have been witness to a once lush hosta, eaten nearly to the ground, doomed to live the rest of the season looking like a patch of celery stalks. Now before you get angry, remember, we all helped create this problem. These cute creatures are just trying to survive, like all wild animals, in a world that is constantly shrinking in on them. Why combat the deer at all? For many homeowners the answer is obvious. Residents often invest large amounts of money to enhance their property with striking landscapes. Unfortunately, a small number of deer can cause thousands of dollars worth of damage in just one night. With the price of plants, shrubs, and trees always on the rise, protecting your investment is, in essence, like having an insurance policy on your landscaping. Furthermore, it will help provide the homeowner with some peace of mind by eliminating the mental anguish of looking at a damaged landscape on a daily basis. So what's the solution? Well, there are many options, often with varying degrees of success. Some of the classic "home remedies" include human hair, soap, eggs, hot peppers, garlic and more. Another is a planting strategy where deer-resistant plants (a list growing shorter every year) are planted on the perimeter with more desirable plants on the interior. Deer netting is another option; but often the result is unsightly, and I have personally witnessed deer pushing through or breaking into netting. They can be pretty determined and crafty animals! Want a foolproof plan? A permanent 9-foot fence surrounding your property, with small vertical grates, is sure to do the trick. The downside is fences are very expensive and restricted by ordinances in many townships. Another option is the many sprays and granulars available at nurseries, gardening supply stores and even big box stores. Their downsides often include foul smell, ineffectiveness, lack of weather resistance and the limited ability of the homeowner to stay on top of the scheduled applications. Last but not least, there are a number of companies that provide deer repellent spraying services, but very few that only specialize in deer repellent. Deer repellents are sprays that protect plant material from being browsed by covering their foliage with a smell suggestive of either animal elements or a spicy taste. Repellents are an effective way of controlling deer damage, however, it is important to understand how they work and when to use them. Repellents either taste bad or smell bad. The most effective do both. 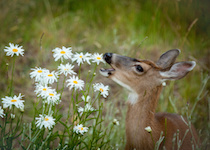 With just bad taste, the deer have sample the plant to know that it is there. 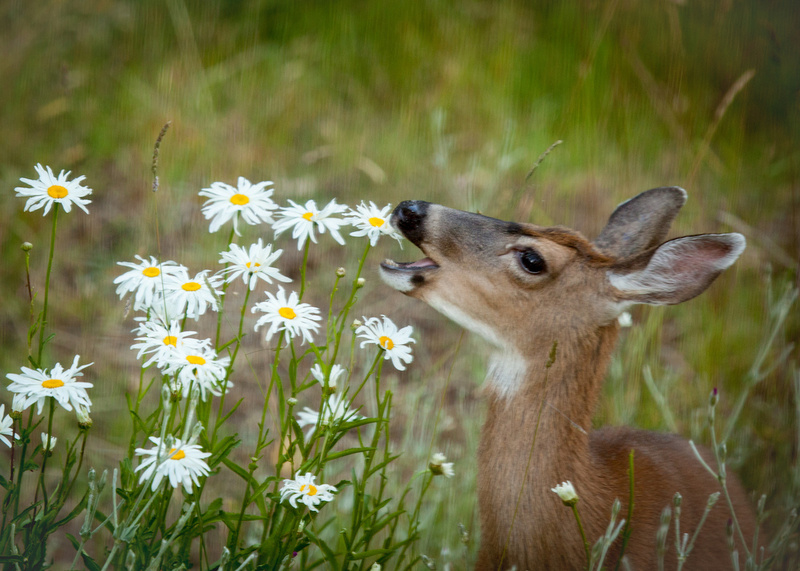 If a product only has a repellent smell component, the deer may feed anyway if they are hungry enough. I recommend that all trees, shrubs and flowers be sprayed monthly as most deer repellents are all natural and do break down after time and start to lose their effectiveness. During the spring and early summer months, I actually suggest spraying on a more aggressive schedule. This will help protect the new growth on fast growing plants such as tulips, pansies and geraniums. Regardless of whom you hire to spray your property, or if you choose to do it yourself, it’s very important that it be keep a strict spraying schedule. ALL “FRIENDS OF FRELINGHUIYSEN ARBORETUM” CAN RECEIVE A FREE TRIAL APPLICATION OF NEW JERSEY DEER CONTROL’S DEER REPELLENT SPRAYING SERVICE BY CALLING AND MENTIONING THIS ARTICLE! !